Contacts Tell All in Social Media… Are You Listening? See and interact with your contact’s LinkedIn and Facebook sites directly from within their contact record in your database? Engage with your contacts by reacting to and commenting on their posts, sending messages, and encouraging them to use their social media to keep current with you? Monitor your contacts so your sales and marketing can provide them with the right communication at the right time? Identify prospects linked to your contacts by “friend” and “connection” links, and expand your network by associating with them? Help you fill in the blanks in your contact records? Use what your contact says about themselves and their lives to discover their interests, needs and wants, and to use note-taking and history functionality to personalise your offerings to them? Did you know Act! already has a quick and simple way to allow you to do this? You don’t have to purchase or program anything. Just access the Social Updates tab from within your contact’s record. The Social Updates tab uses Internet Explorer to give you access to LinkedIn and Facebook. Login to your Act! database. 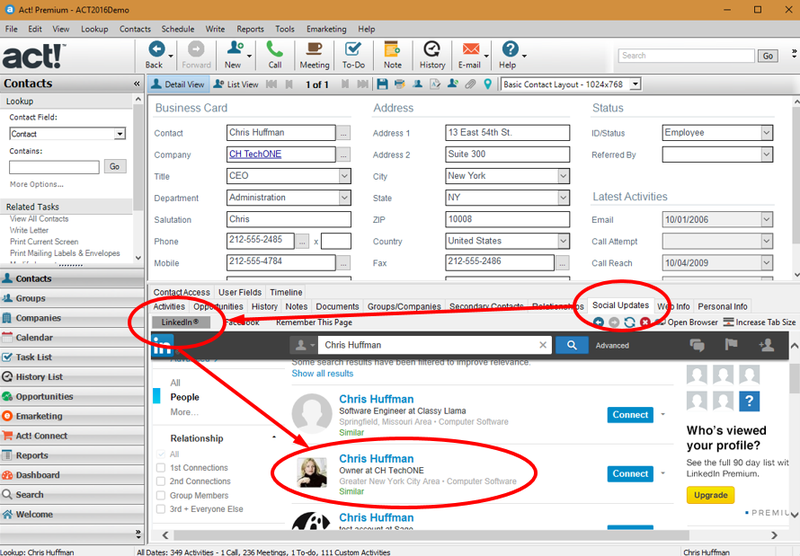 Navigate to the Detail View of a contact whose LinkedIn or Facebook profile you wish to view. Click the Social Updates tab. Click either LinkedIn or Facebook, depending on which social media profile you wish to view for the contact. Then click the matching search result shown in the tab to bring up their profile. Note: You may be prompted to log in to your Facebook or LinkedIn account if you do not already have Internet Explorer configured to remember your login. If so, log in before proceeding to the next step. After verifying that you have accessed the correct profile, click Remember This Page to save the page so that it will automatically open when you return to the contact’s Social Updates tab. If desired, repeat the same process for the other social media site. Note that in Facebook, if you are already “friends” with the contact, you will be able to see their page and their publicly shared content without any trouble. However, if you are not “friends” with the contact, you should click “Add Friend” in order to also see what they share with people they are connected to. It is not possible to remove the association so that there is no longer any link. However, if you want to change the link, you can browse to a different page and then click Remember This Page so that you associate the new page with the Act! contact. What if the Social Updates tab stops showing the right page? If after some time the correct page is no longer displayed when you click LinkedIn or Facebook, then it is likely that the URL of the correct page has been changed by the social media site. Try to search for the page again in the site using the contact’s name. If you find it, open it and click Remember This Page to associate the new, correct URL to the contact. What if I want to link to other social media pages besides LinkedIn and Facebook? It is possible to link to another social media page, such as Twitter or even the contact’s own website, from within the contact record, but you cannot use the Social Updates tab to do so. Instead, you can use the Web Info tab. The Web Info tab allows you to specify a list of pages that you want to associate with the contact, or that you might find useful to have at your fingertips when working with the contact. Continue to the next post about how to use the Web Info tab to link to other sorts of information about your contact!